I packed my gear and snacks (yes, at 37 weeks pregnant, I needed some snacks) and headed out the door to the hospital. As soon as I got to the room, I saw the soon-to-be parents, Meg and Grant. They were expecting their first child. I noticed the shirts they were wearing. It was a perfect way to send positive energy in the room. Grant was wearing “Strong”. Meg was wearing, “BElieve in YOUrself. ” Even their doula, Jennie, was wearing a shirt saying, “Welcome Home”. Those were a few of the small reassurances that this birth was going to be amazing. The lights dimmed in the delivery room. The soft sounds of worship music was playing on Grant’s phone. Then the song, “It Is Well with My Soul” played. I cried. How beautiful! It was the perfect setting for a baby to arrive. Meg labored majority of the time in water. It was very soothing and calming. At moments, she would be in a trance-like state after a strong contraction. And like many women, she powered through and let her body do what it needed to do for her baby. Through every contraction, her husband was there to be the support Meg needed. A hand to hold. A shoulder to lean on. An embrace to feel. She transferred to her bed and finished laboring there. She pushed. Calmly. Quietly. And with determination. She was present with every push, every contraction, and every surge. Then he was here. Brady. All seven pounds of perfection. 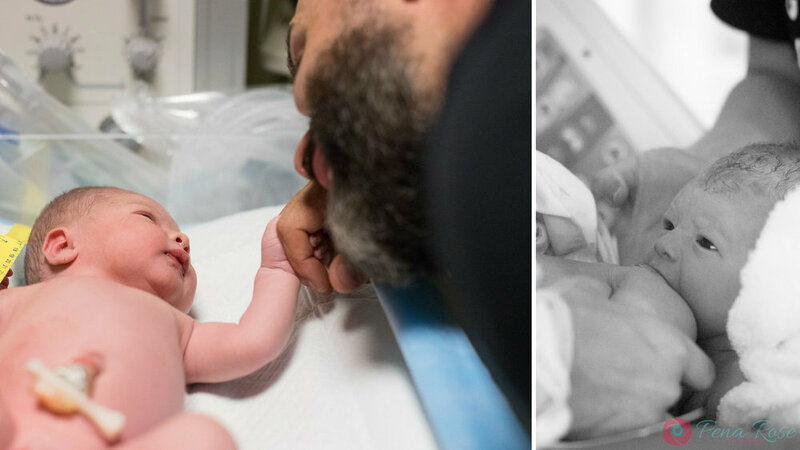 As the birth photographer, I was able to capture the firsts of many. The first touch from a father. The first kiss from a mother. The first first lesson of love. Meg & Grant - Thank you for trusting me to photograph this monumental and intimate moment of your family. It was an honor to document the birth of your first child. It was also a gift to witness the birth of a mother and a father. You are such a beautiful family. Many blessings. A birth can only happen once. No retakes. So why not photograph it? If you would like to document your child’s birth story, contact me HERE. Each birth story is a unique and intimate experience. Now booking for 2019!